Keep them in 5-point harnesses! I've seen this video once before, but now she's donating money based on people leaving comments. Go look at the video and learn why it's important to keep kids in 5-point harness restraints until they are 80 pounds. Don't watch without some nice, soft Puffs with Lotion though. Then leave a comment to up the donation by $3. All it costs you is a little time and you learn so much. But that won't stop me from writing about it! I first heard about it on Daring Young Mom's blog and felt like I had a lot to say, almost too much. Then when I saw Owlhaven's post, with it's simple and heart-felt message that cuts right to the heart of things I figured out how to say what I wanted. There are countries in this world that are thrilled to announce that their Down syndrome birthrates are declining. Sadly, the reason these rates are declining is not because they have found a cure -- unless you call very early prenatal testing and abortions a cure. I don't. 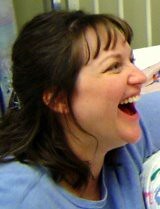 I found 2 articles (so far) that share my view that people with Down syndrome are worth giving birth to. Their lives are not so short and empty that they should be aborted. And since there is no cure, what else can early testing lead to? The first is by Patricia E. Bauer and was in The Washington Post. The second article is by George F. Will and appeared in Newsweek. My husband and I were lucky, I guess. My OB/Gyn asked us if we wanted amniocentesis and we asked back weren't the risks of miscarriage great at my "advanced maternal age"? He said yes and then asked the big question: Is there any reason that you would want to terminate the pregnancy? We both said no, so he agreed that the increased risk of miscarriage wasn't worth it. What if we hadn't been so sure of ourselves? I wonder now if his advice would have been different. As I sit here typing this and listening to The Biscuit through the baby monitor, I thank God that we didn't know so that we didn't have to deal with medical professionals that might have prodded us towards not having him. It seems like the Choice debate always centers around women and their right to choose or the child's right to be born. We are missing out on something and it is quietly slipping by: doctors give pregnant women advice. When the doctors' information is not up-to-date, women get out-dated advice and then make life and death decisions based upon that old way of thinking. The doctors MUST be taught that the best advice is to talk to someone who is living in the situation, whether it be an adult with Down syndrome or the parent of a child who has Down syndrome or whatever. A doctor, just like any other human being, cannot know what it is like to live with something unless they are actually living with it. And we have to learn to be self-advocates and ask to be referred to support groups. Maybe after meeting some adults with Down syndrome and learning about the wonderful things that are happening today it wouldn't be so scary. And maybe then, with this better advice, 85% of these children wouldn't get aborted. Have you heard about Melissa Summers "interview" on the Today Show? Well you can get it all on her blog called Suburban Bliss. There have been a lot of entries about her experience, but today's was the best IMHO. So many have written so much about this that really I just want to add where to send your thoughts to NBC. Check out this post for an example email that I loved. Meredith Vieira has a blog on iVillage. Who knew? On Fridays she answers questions from the past week and with so many comments about her behavior during this interview, maybe she'll talk about that on February 2nd? I'll be checking in to see what she says. After reading the article I looked at his blog. There aren't a lot of entries but they make the ones that are there count. There was an entry about a friendship club at a Southern California high school, another about an article I had already read in the NY Times about people with Down syndrome going to college, and two posts about a couple with Down syndrome that got married. That last entry really intrigued me so I followed the links off to see the husband's website (classical music will start to play when the site loads -- he's a musician). There I found his page that has a video of his proposal, which certainly made me cry! I'm not sure how I found it but I also read the story on Time Magazine's site about their wedding and looked at the photos too. I found so many treasures at this blog that I just felt a need to share. There was more, not necessarily as uplifting, that I found through their blog, but these were the wonderful parts that had me crying and smiling. This was such a beautiful post! I am so looking forward to the day when The Biscuit is ready to be independent because I think it will probably be a long time coming. Right now at 19 months old he is still wearing clothes that say they are for 9 months. I keep telling myself that there are other moms who are sad because their little ones are growing up so fast and really I'm lucky. But I want him to get to that point some day. Because of the new pregnancy and finding out that The Biscuit needs a second heart surgery, I think that I have recently started to go back through the grieving that we did when The Biscuit was born. More precisely, when he was 3 days old and they took him from my room to the NICU because of the problems with his heart. This was the same time that we found out he has Down syndrome (Ds). Oh, the tears. How could they give me this news and then take him from me? But he is such a cool little kid! He would not have this personality without the Ds, so it has made it easier to accept -- and to accept him for who he is both good and, well, not bad really, but as his mom I can't help but worry. I worry about the things that the moms of typical kids do and the things that they don't. I don't know which bothers me most. I know of a mom who got upset when her son was just a baby because she was thinking of how someday a girl was going to break his heart. Once I had The Biscuit I remembered this story and fell apart thinking "What if no little girl ever loves him?" I have the fears that other moms do -- and I fear that he'll miss those things that "everyone" experiences. Now I worry that there will be something wrong with The Cupcake. And if there isn't? Oh, a whole other pile of worries. Will she resent her brother and the possibility that he will outlive us so that she will have to help take care of him? Will she think that we had her just so there would be someone to take care of him later? Or will he think he isn't good enough and we wanted her because he's "broken"? Some days it is just too much. Luckily I can just go sit down and play with him and all of the worry & sadness falls away. He is so cool. He makes jokes, gives hugs and kisses, and really seems to enjoy hanging out together as much as I do. And really, what more could I wish for? No matter who I pick for a host, when I try to update my blogger profile it says it can't find it. Arrrrrrgh! I figured it out, I think. I did it the way they said to in Blogger's help, even though Flicr's help said that I could do it that way but it would be wrong. Whatever, the photo's up now!